Buy fun women’s socks online at Woven Pear! Woven Pear is a new entrant to the online sock business — and we love what they have to offer. Focused exclusively on fun socks for women, Woven Pear is your source for high quality women’s socks. Each pair of socks is made from high quality woven cotton, and “dyed and dipped by hand” to ensure the best colors come through while you are wearing their clothes. We obviously would not be talking about Woven Pear if they didn’t offer a Socksubscription! That’s right — Woven Pear has a sock of the month club for women who want to keep their feet stylish. Every month, sock club members receive three new “pears” of socks that are exclusive to subscription members. 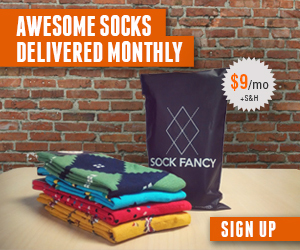 Pricing starts at $24.99 per month, and you can save money by committing to sign up for a full 6 or 12 month sock subscription. 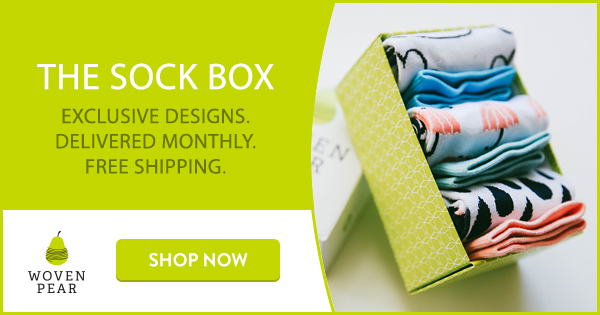 Additionally, Woven Pear makes it easy to give the gift of a sock subscription rather than sign up yourself. Want to know what others think of Woven Pear? Their site has over 500 reviews from actual customers, so you can verify the quality, customer service, and value that you are getting at Woven Pear. Sign up today for the Woven Pear “Sockscription” fun sock of the month club for women! We are part of several affiliate marketing networks. By clicking and/or purchasing items via certain links on this site and across related social media platforms, we may receive a small commission.